When my boy came to one year milestone, we started teaching him to walk. It was not very easy task also mentioning my back ache and his huge wish to stand and walk around while still not entirely ready for it. Our boy was so eager to be independent and do everything himself that our hands were more like obstacles to his freedom than valuable help. All days long we had to keep an eye on him so he did not fell or walked into something. These days we have innovative the Juppy Baby Walker Momentum which helps parents and babies to make first steps much easier. 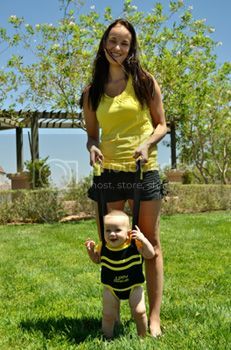 The idea is that you sit your kid into the Juppy Baby Walker and hold it using straps. While a parent maintains a natural posture with adjustable straps to fit your height (from 4'11" or 6'11"), a kid gets freedom of walking around. I like that I do not need to hold kid’s hands and the baby has the natural posture for walking too. The baby feels confident and independent too since his hands are free, no need to hold something to stand up and no pressure on baby to move on. The Juppy has soft hand grips that are designed to provide maximum benefit for parent’s hands. No more dangerous spots or falling down the stairs, the Juppy Baby Walker Momentum requires parent’s assistance all the time. 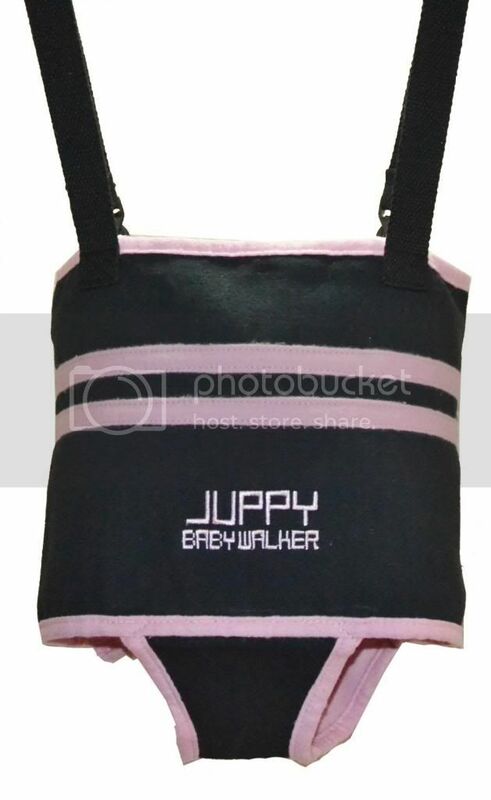 Plus the Juppy Baby Walker comes with a nice bag so you can put it in and take with you. No worries about making mess, 100% cotton made, the Juppy is machine washable. For more information about the Juppy Baby Walker Momentum, varieties and colors visit their website, find them on Facebook, Twitter, Pinterest, You Tube and check their blog. And now giveaway time, one lucky reader will win Pink Juppy Baby Walker Momentum, the giveaway is open to US and Canadian residents only and ends February 14, 2014. I would like to win it for my cousin. She has down syndrome and she's 20 months and isn't walking yet. This would help her to learn. Thanks for the chance. The baby that I have growing at the moment, not due to be born for a few weeks. the baby girl i babysit. she is 9 months and really trying to walk. I'd like to win this for my baby boy. I would like to win for a good friend. Her daughter was born May 23rd and they found out they were expecting TWIN boys in September that are due May 19th. This could help her out so much and get her daughter walking before the twins arrive! Great way to add a bit extra help to the learning process. For both you and baby! This would be perfect for my BFFs baby! Thanks for posting this giveaway to my weekly giveaway linky (http://www.journeysofthezoo.com/category/giveaway-linky). I would like to win this for my Niece..She is due for Feburary 6th, 2014..She is now over due 2 days for Baby Addyson! I would like to win it for my new grand baby due in June. I would love to win this for my sister in law. She's due any day now! Myself! This will be awesome for our baby come summer! I would like to win it for my big sister! Despite it being pink, I'd like it for my little guy. I would love it for my 5 month old little girl, so soon she will need it! I would love to win this for my friend who is due with her first baby in May! myself, im due july 11th! I want to win it for my little girl. My sister in law who is due so soon!!! I'd like this for our granddaughter. Love to win for my nephew. This would be for a relative who is expecting a baby girl. I'd like this for myself! By selecting a reliable brand and creating a safe environment, you can mitigate the risks of baby walkers, allowing your baby to explore her surroundings and have fun.